For other uses, see Rose Garden (disambiguation). Volksgarten, Vienna. A public park in the heart of Austria's capital, famous for its beautiful rose gardens with over 3,000 plants of more than 200 different cultivars of roses. Morwell Centenary Rose Garden in Morwell, Victoria, with over 4000 rose plants on an area of 4 acres (1.6 ha) and a focus on rose breeders from Australia and New Zealand, both historical and modern. The WFRS granted the Award of Garden Excellence in 2009. Coloma Castle, in Sint-Pieters-Leeuw, six miles (10 km) south of Brussels has more than 60,000 rose plants of some 3,000 different varieties. These include a complete collection of Belgian-raised roses and an area devoted to historic roses. The largest rose garden features varieties grouped by country and by breeder. Rosenneuheitengarten Beutig in Baden-Baden was created between 1979 and 1981 and is the venue of the Baden-Baden Rose Trials. It contains about 5000 plants in a demonstration garden and a trial garden were more than 400 roses are tested for four years. It was granted the WFRS's Award of Garden Excellence in 2003. The Wohl Rose Park in Jerusalem. Rosarium Oudwijk (Wilhelminapark) is a public park in Utrecht, and the large rose garden was created in 1913. Queen Mary Gardens in Regent's Park, London is a circular rose garden surrounded by a ring of pillars where climbers and ramblers are displayed. It includes a mix of formal rose beds and more informal displays and some 40,000 roses are in bloom in the sujmmer. The Gardens of the American Rose Center in Shreveport, Louisiana is headquarters of the American Rose Society and opened in 1974 (having relocated from Columbus, Ohio). It contains more than 65 individual rose gardens and 20,000 roses, shown with companion plants, sculptures and fountains. The Municipal Rose Garden in Tyler, Texas was opened in 1952 and includes over 600 varieties of rose. It is also an All American Rose Selection (AARS) test garden. It hosts the Texas Rose Festival each October. The Elizabeth Park Conservancy Rose Garden in Hartford, Connecticut originally opened in June, 1904. Today the rose garden covers 2.5 acres and has over 800 varieties and 15,000 rose bushes. The James P. Kelleher Rose Garden in Boston, Massachusetts is located within the Back Bay Fens, part of the city's Emerald Necklace parks. It is the location of the annual Mayor's Garden Party. It contains 200 varieties of roses and 1500 plants in total. The Roger Williams Park Victorian Rose Garden in Providence, Rhode Island This garden was restored and is maintained with the assistance of the Rhode Island Rose Society. One of its notable features is the Brownell Rose Bed; the Brownells were famous Rhode Island rose hybridizers and many of their now hard-to-find varieties are preserved here. White House Rose Garden in Washington, D.C.
Thomasville Rose Garden in Thomasville, Georgia. Once home to a world renowned test garden, the “City of Roses” boasts the second oldest Rose Show in the United States every year. The show takes place on the weekends of the fourth Friday in April and has been put on every year since 1921. The rose Garden is home to hundreds of varieties of roses. Wikimedia Commons has media related to Rose gardens. ^ a b "The Emerald Necklace Conservancy - Boston, MA" (PDF). The Emerald Necklace Conservancy. Retrieved 19 July 2018. ^ a b "ROGER WILLIAMS PARK – VICTORIAN ROSE GARDEN". Rhode Island Rose Society. ^ a b c d e f g h i j k l m n o p "Award of Garden Excellence". World Federation of Rose Societies. November 2012. Archived from the original on 2014-07-27. Retrieved 2014-08-11. ^ "Rosedal de Palermo". World Federation of Rose Societies. 2012-12-11. Retrieved 2014-08-11. ^ "ruston's roses". Retrieved 2014-08-12. ^ "Morwell Centenary Rose Garden". World Federation of Rose Societies. 2012-11-09. Retrieved 2014-08-11. ^ "Victoria State Rose Garden". World Federation of Rose Societies. 2012-11-10. Retrieved 2014-08-11. 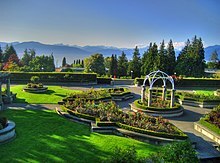 ^ "VICTORIA STATE ROSE GARDEN TIME LINE". Victoria State Rose Garden. ^ "The Garden of Roses at Hex Castle". World Federation of Rose Societies. 2012-11-10. Archived from the original on 2014-08-12. Retrieved 2014-08-11. ^ "International Rose Garden Kortrijk". World Federation of Rose Societies. 2012-11-10. Retrieved 2014-08-11. ^ "The Rose Garden at Vrijbroek Park". World Federation of Rose Societies. 2012-11-10. Retrieved 2014-10-22. ^ "The Rose Garden at the Montreal Botanical Garden". World Federation of Rose Societies. 2012-11-10. Retrieved 2014-08-11. ^ "Shenzhen Renmin Park". World Federation of Rose Societies. 2012-11-10. Retrieved 2014-10-22. ^ "Zijing Park". World Federation of Rose Societies. 2012-12-10. Retrieved 2014-10-22. ^ "La Roseraie de Bagatelle". World Federation of Rose Societies. 2012-11-10. Retrieved 2014-08-11. ^ "Rosenneuheitengarten Beutig". World Federation of Rose Societies. 2012-11-10. Retrieved 2014-08-11. ^ "Il Roseto Botanico 'Carla Fineschi'". Worldrose.org. Retrieved 19 July 2018. ^ "Grange Park (Parc de la Grange)". switzerland-geneva.com. ^ "American Rose Society". ars.org. ^ "Rose Gardens". Rosegardenstore.org. Archived from the original on 2005-12-28. ^ "Peggy Rockefeller Rose Garden". nybg.org. ^ "Tyler Texas Rose Garden". tylertexasonline.com. Tyler Texas online. Retrieved 8 October 2015. ^ "Rose Garden". Elizabeth Park Conservancy. ^ "World Federation of Rose Societies". Worldrose.org. Retrieved 19 July 2018. ^ "Directory of Rose Gardens 2014" (PDF). WFRS. Retrieved 2014-10-22.